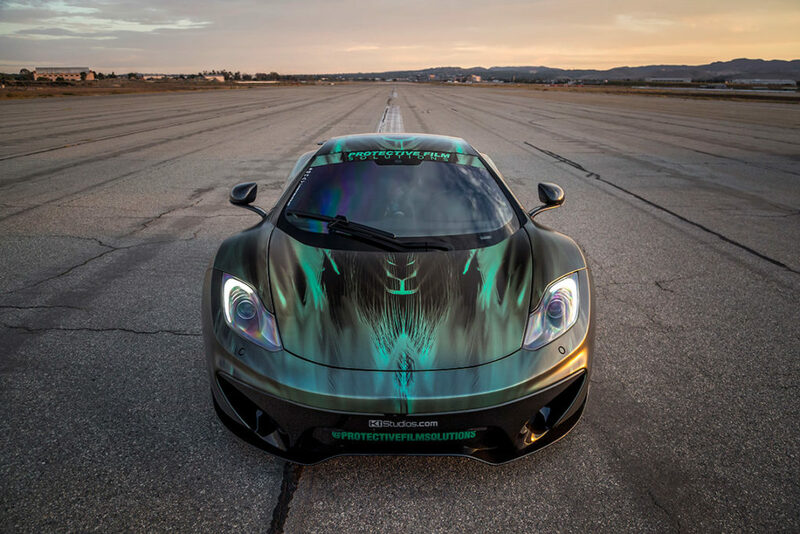 When you’re a McLaren shop car for a vehicle wraps company guess what happens? You get wrapped in all matter of designs and colors, often. 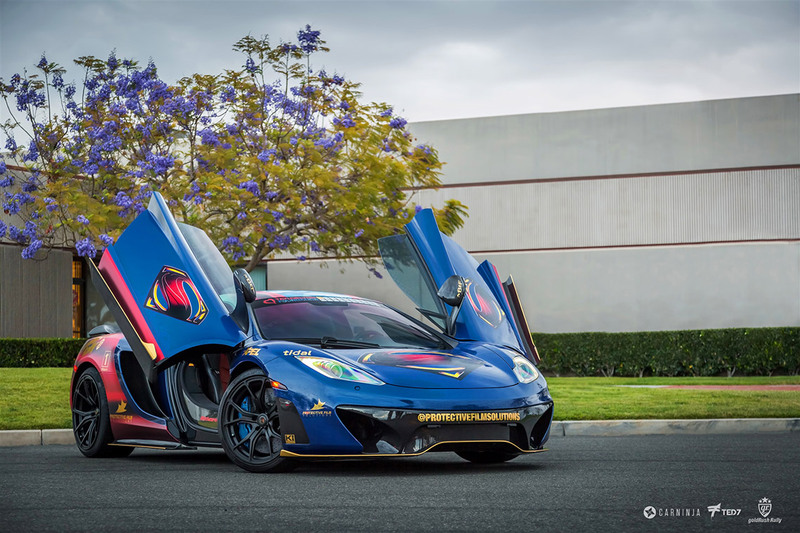 The case is no different with this 12C. 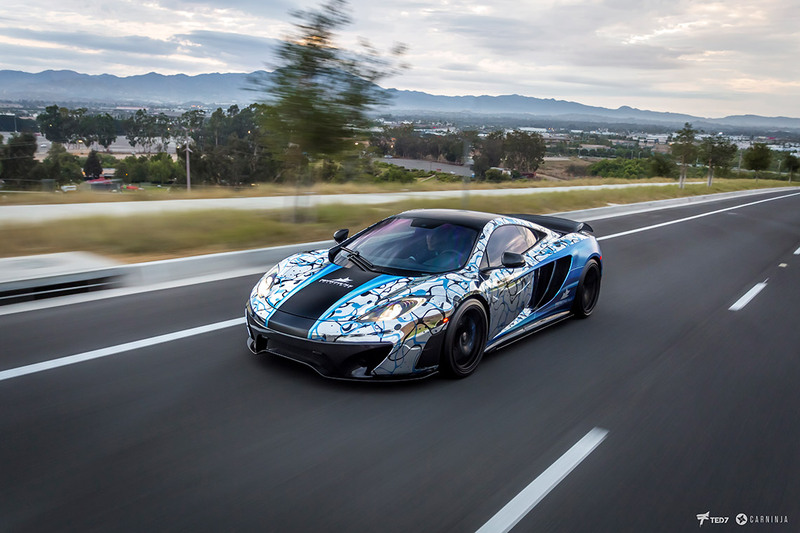 When you’re a McLaren shop car for a vehicle wraps company… You get wrapped in all matter of designs and colors, often. This latest design is an experiment in extreme wrapping. The intricate design is printed on Avery Dennison Conform Chrome using latex ink, then laminated. For the final effect, the wrap was then wrapped again with XPEL STEALTH clear film. This means there are pretty much 3 layers of vinyl on it. These include the printed wrap, the lamination and the clear bra film. Now we wouldn’t recommend this to our customers necessarily as such a thick wrap causes some issues with warping and such. However, as an experiment as to how far we can take it, it’s excellent. 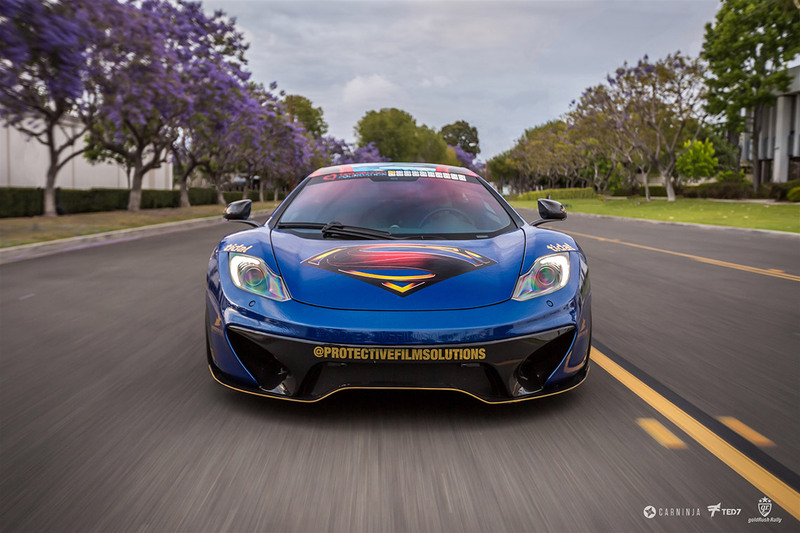 Before that our McLaren MP4-12C has seen a matte blue wrap with Protective Film Solutions logos, a metallic printed “aqua” theme and the Superman superhero wrap for Gold Rush Rally 8 and the Taylor Lynn Foundation. All these came before the current green peacock wrap. The Protective Film Solutions McLaren MP4-12C has more than just a good-looking catalog of wraps under its belt. The car rocks a Vorsteiner Carbon Fiber Aero kit. 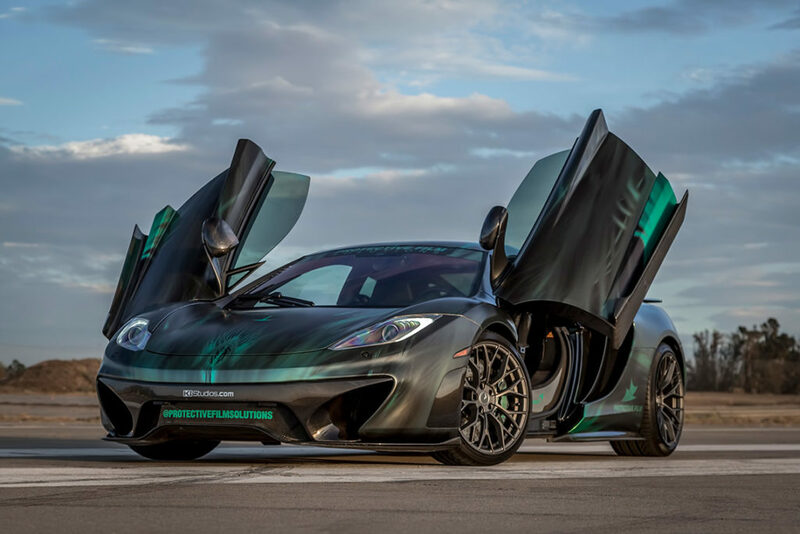 The 12C is also tuned for performance and sound by GMG Racing. We are going to post each of these designs below to take your through the history of the car. A favorite has to be the aqua chrome theme, with the green peacock in a close second. The comic book fans will still pick the Superman theme as their favorite. All the photos are by Ted 7 Photography unless stated. 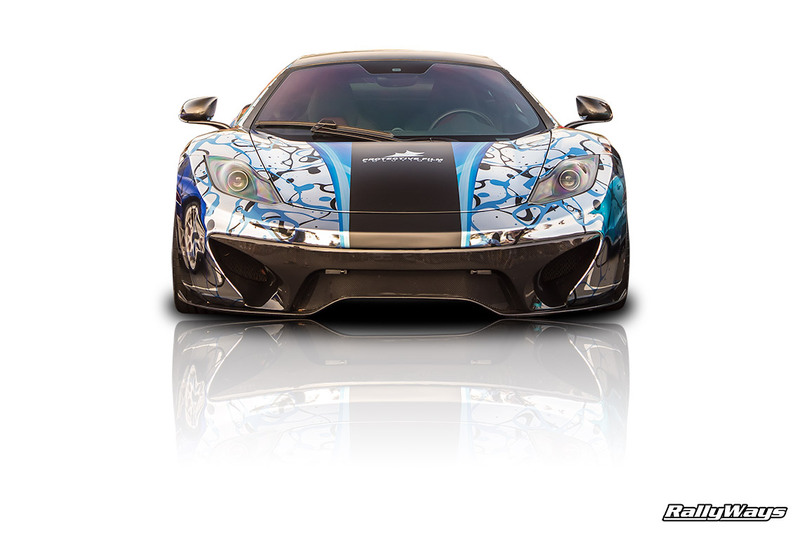 The PFS MacLaren MP4-12C in one of the early wraps – satin blue. Here is a photo of the car during Gold Rush Rally 8. This is with the Superman wrap designed by KI Studios. This one is with the famous “aqua chrome wrap”. This is one of the most popular ones. Photo shot by RallyWays at Cbad Cars and Coffee Carlsbad. Here is the Aqua Chrome Wrap again, this time another awesome rolling shot by Ted 7. 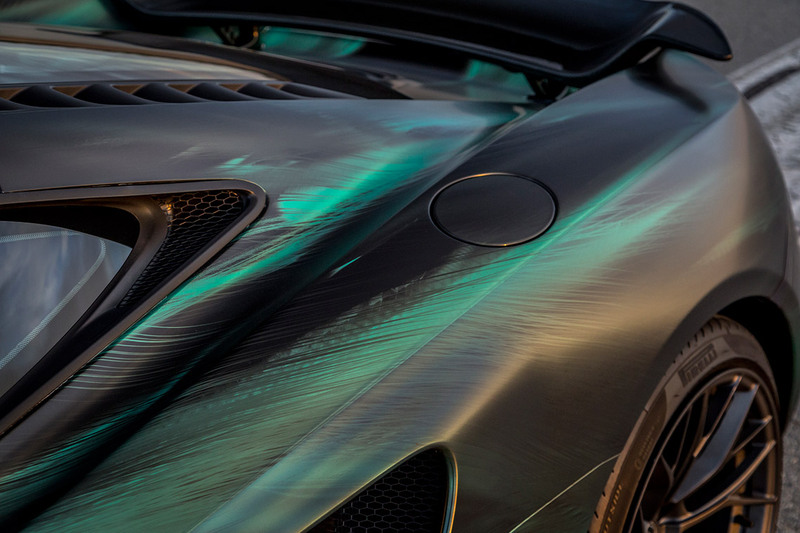 This wrap really is amazingly unique and very stunning. No wonder it’s a favorite. This photo shows the intricate level of detail on the peacock green wrap. Notice the sating finish provide by the top layer of XPEL STEALTH. To wrap things up (pun may or may have not been intended), here’s another good look at the Superman wrap.